Bagheri, F., Tarokh, M. (2014). Customer behavior mining based on RFM model to improve the customer relationship management. Journal of Industrial Engineering and Management Studies, 1(1), 43-57. F. Bagheri; M.J. Tarokh. "Customer behavior mining based on RFM model to improve the customer relationship management". 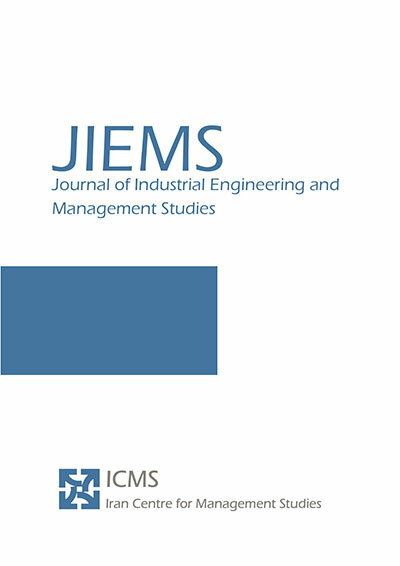 Journal of Industrial Engineering and Management Studies, 1, 1, 2014, 43-57. Bagheri, F., Tarokh, M. (2014). 'Customer behavior mining based on RFM model to improve the customer relationship management', Journal of Industrial Engineering and Management Studies, 1(1), pp. 43-57. Bagheri, F., Tarokh, M. Customer behavior mining based on RFM model to improve the customer relationship management. Journal of Industrial Engineering and Management Studies, 2014; 1(1): 43-57. K. N. Toosi of Technology, Tehran, Iran. Companies’ managers are very enthusiastic to extract the hidden and valuable knowledge from their organization data. Data mining is a new and well-known technique, which can be implemented on customers data and discover the hidden knowledge and information from customers' behaviors. Organizations use data mining to improve their customer relationship management processes. In this paper R, F, and M variables for each customer are defined and extracted. Customers are clustered by using K-mean algorithm based on their calculated R, F and M values. The best number of clusters is calculated by Davies Bouldin index. The clusters are ranked based on their eligibility values. By analyzing the clustering results, we propose some offers to the company to calculate the premiums and insurance charges. Aczel, J., Saaty, T. 1983. “Procedure for Synthesizing Ratio Judgments”, Journal of mathematical psychology, 27, 93-102. Bayam, E., Liebowitz, J., Agresti, W. 2005. “Older drivers and accidents: A meta analysis and data mining application on traffic accident data”, Expert Systems with Applications 29, 598–629. Blows S., Ivers, R.Q. , Connor, J., Amaeratunga, S., Norton, R. 2003. “Car insurance and the risk of car crash injury”, Accident Analysis and Prevention 35, 987–990. Chang, D. Y. 1996. “Applications of The Extent Analysis Method on Fuzzy-AHP”, European Journal of Operational Research, 95, 649-655. Chang, D. Y. 1992. “Extent Analysis and Synthetic Decision”, Optimization Techniques and Applications, World Scientific, Singapore, 1, 352. Cheng, C.H., Chen, Y.S. 2009. “Classifying the segmentation of customer value via RFM model and RS theory”, Expert Systems with Applications 36, 4176–4184. Choya, K.L., Lee, W.B., Lo, V. 2002. “Development of a case based intelligent customer-supplier relationship management system”, International Journal of Expert system with Application 23(3), 281-297. Fayyad, U., Piatetsky-Shapiro, G., Smyth, P. 1996. “From data mining to knowledge discovery in database”. American Association for Artificial Intelligence, 37–54. Fayyad, U. 1997. “Data mining and knowledge discovery in databases: implications for scientific databases”. In proceedings of the ninth international conference on Scientific and statistical database management, 2–11. Forgy, E.W. 1965. “Cluster analysis of multivariate data: efficiency vs interpretability of classifications”, Biometrics 21, 768–769. Goodman, J. 1992. “Leveraging the customer database to your competitive Advantage”, Direct Marketing 55 (8), 26–27. Gui, G., Wong, M.L. 2004. “Implementing neural networks for decision support in direct marketing”, International Journal of Market Research 46 (2), 235–254. Halkidi, M., Batistakis, Y., and Vazirgiannis, M. 2002. “Cluster validity methods: part II”, SIGMOD Rec., Vol. 31, No. 3, 19-27. Helfert, M., Heinrich, B. 2003. “Analyzing Data Quality Investments in CRM- A model based Approach”, School of computing. Hughes, A.M. 1994. “Strategic Database Marketing”, Probus Publishing, Chicago. Hyunseok, H., Jung, T., Suh, E. 2004. “An LTV model and customer segmentation based on customer value: a case study on the wireless telecommunication industry”, Expert Systems with Applications 26, 181–188. Irvin, S. 1994. “Using lifetime value analysis for selecting new customers”, Credit World 82 (3), pp. 37–40. Kahraman, C., Cebeci, U., and Da, R. 2004. “Multi-Criterion Comparison of Catering Service Companies Using Fuzzy AHP: The Case of Turkey”, International Journal of Production Economics, 87, 171-184. Kaymak, U. 2001. “Fuzzy target selection using RFM variables”. in Proceedings of IFSA World congress and 20th NAFIPS international conference 2, 1038–1043. Kevork, E.K., Vrechopoulos, A.P. 2009. “CRM literature: Conceptual and functional insights by keyword analysis”. Marketing Intelligence and Planning, 27(1), (), 48–85. Kotler, P. 1994. “Marketing management: Analysis, planning, implementation, and control”. New Jersey: Prentice-Hall. Lee, J.H., Park, S.C. 2005. “Intelligent profitable customers segmentation system based on business intelligence tools”, Expert system with Applications 29, 145-152. Liao, S.H., Chen, Y.J. 2004. “Mining customer knowledge for electronic catalog marketing”. Expert Systems with Applications, 27(2), 521–532. Liao, S.H., Chen, C.M., Wu, C. H. 2008. “Mining customer knowledge for product line and brand extension in retailing”. Expert Systems with Applications, 35(3), 1763–1776. Liao, S.H., Chen, Y., Tseng, Y.Y. 2009. “Mining demand chain knowledge of life insurance market for new product development”, Expert Systems with Applications 36, 9422–9437. Lin, Y., Su, H.Y., Chien, S. 2006. “A knowledge-enabled procedure for customer relationship management”, Industrial Marketing Management 35, 446-456. Liu, D.R., Shih, Y.Y. 2005. “Integrating AHP and data mining for product recommendation based on customer lifetime value”, Information & Management 42, 387–400. Peacock Peter, R. 1998,”Data mining in marketing: Part 1”. Marketing Management, 9–18. Peppard, J. 2000. “Customer relationship management (CRM) in financial services”, European Management Journal, 18(3), 312–327. Peppers, D., Rogers, M. 1996. “The one to one future: Building relationships one customer at a time”. NY: Doubleday. Saaty, T.L. 1980. “The analytic Hierarchy process, Planning, Priority, Resources Allocation”, RWS Publication, USA. Shapiro, A.F. 2004. “Fuzzy logic in insurance”, Insurance: Mathematics and Economics 35 () 399–424. Soopramanien, D., Juan, L. H. 2010. “The importance of understanding the exchange context when developing a decision support tool to target prospective customers of business insurance”, Journal of Retailing and Consumer Services 17, 306–312. Stone, B, 1995. “Successful Direct Marketing Methods”, Lincolnwood, NTC Business Books, IL. Šubelj, L., Furlan, S., Bajecl, M. 2011. “An expert system for detecting automobile insurance fraud using social network analysis”, Expert Systems with Applications 38, 1039–1052. Wang, Y.M., Elhag, T.M.S., Hua, Z. 2006. “A Modified Fuzzy Logarithmic Least Squares Method for Fuzzy Analytic Hierarchy Process”, Fuzzy sets and Systems 157, 3055-3071. Witten, I.H., Frank, E. 2005. “Data mining: Practical machine learning tools and techniques” (2nd ed. ), USA: Morgan Kaufmann Publishers.